Enrich your organization chart with more information in a clear and neat way to make it a better employee directory. The fundamental purpose of organization chart is to communicate information. It may be used to show management structure, serve as employee reference or employee directory. When it serves as the last role, it needs to be enriched with more information, such as headshots, telephone numbers and email addresses. A detailed introduction of each staff can even be attached to the chart so that employees can know each other better through convenient Internet access. See how to realize it in the following section. Insert a photo of each employee so that the org chart becomes much more visual. Some software, like Edraw, includes more advanced functions for inserting pictures and photos. Users can choose a photo organizational chart template. Drag photo shapes to represent staff. The finely-designed shapes have already separated different data in different rows, just double click to insert text and then use the action button to replace picture. Photos can be inserted on left or top. The inserted headshots will be resized automatically to fit in the shape. And it also support manual resizing through the selection handles. Learn more about this in Design a Photo Organigram in One Breath. If you don't want your org chart to look too cramped but still desire to offer detailed contact information in it, you can solve this dilemma by adding note. From the Insert tab, choose Note, type necessary information in the dialogue box. Just as the illustration shows, adding note can overcome the limitation of shape size and contain more information, including phone number, email address as well as house address. They remain hidden and will appear instantly when the cursor is over the note thumbnail. In this way, the org chart looks clear and neat. Are you tired about searching documents? In a large organization, there are so many materials about staff; some are paper files, some are electronic form and other information is on your website. How to integrate all information of employees in only one place? Actually Edraw can help managers, especially human resources managers work on a paperless strategy and integrate all available information. The solution is applying attachments or hyperlinks. Scan papers and attach them to your org chart. Edraw's attachment support copy and become a real part of the chart, which means when users send or copy the chart, the attachment still stick to the chart. 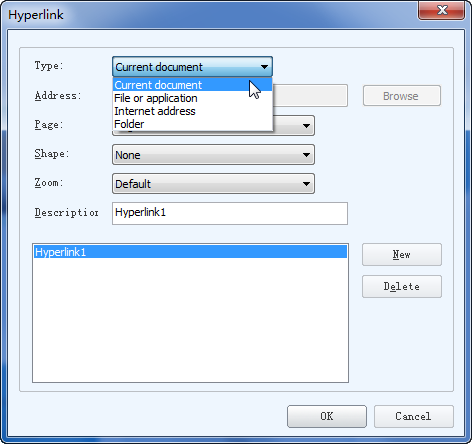 By adding hyperlinks, one click will lead users to another page of the chart, another file or a web page. Everything related is integrated, so easily. Besides the functions mentioned above, Edraw offers many more amazing features to gain marvelous organigrams. Firstly, have a look at its user-friendly interface. Since Edraw is dedicated to simplifying diagramming process, most hard stuff has already been tackled by it. Users will indulge in their amazing works made with little effort. Shapes and connectors can be generated automatically. Shapes generated automatically are same size by default. Relayout requires only 1 click. Specialized org chart tools enable easier and faster formatting and modification. Supports custom organization chart creation. Seeing is believing. Download these templates created by Edraw for your own use. They are all vector format, editable and printable. And you can get online to sync for more featured contents in addition to awesome templates.